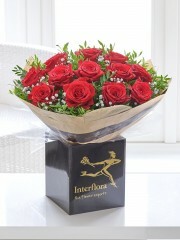 Stonehaven flowers select various red flowers to create the perfect bouquet for your loved one. Be it the vibrant red roses, striking red tulips or the warmth of tropical heliconia’s, a bouquet filled with these deep colours are enough to please anyone. The expert florists at Stonehaven flowers strive to produce nothing but the finest bouquets possible. With their wealth of experience Stonehaven florist know exactly how to provide their customers with the finest quality flowers and arrangements. Our online store boasts a selection of these stunning red flowers, all of which would make the most exquisite gift. If you find yourself however wanting just that something extra or a personal touch to your order, the expert florists at Stonehaven flowers are on hand to give you guidance. Simply tell your local Stonehaven florist the tastes of your chosen recipient and they will work their magic to create for you the most delightful bespoke bouquet. Nothing says ‘I Love You’ like a classic arrangement of romantic large-headed red roses. These hand-tied spray will be a fantastic present for that special someone whatever the occasion. Stonehaven flowers know how to create eye-catching red flower bouquets that will not disappoint. These flowers are the ultimate way to spoil any loved one be it their birthday, a special surprise or an anniversary. The rich lavish colours of these flowers are entirely captivating and will produce that lasting impact you desire. You can choose from a number of gifts to accompany your bouquet including fine wines, champagnes or a generous box of chocolates all of which will be a lovely surprise. A heart-felt note can be written by yourself with the direction of the Stonehaven florists to make sure your chosen recipient knows exactly how much they mean to you. The expert florists here at Flowers Stonehaven wish you to enjoy ordering with them and for you or your loved one receive the highest levels of satisfaction. Ordering with Stonehaven Florists is quick and easy. Either through our online website or calling our store, you can have your flowers ordered and delivered in the same day. This premium service by Stonehaven Flower Delivery allows you to order before 3pm and still be assured the one you have in mind will receive their special surprise on the same day. Flower Delivery Stonehaven also offer a number of other delivery options including time slots before and after 1pm. Stonehaven Flower Delivery offer a flower delivery service 6 days a week, Monday through to Saturday. Stonehaven florists aim to please. It can be assured by us that your bouquet will make any event or occasion a memorable one. The expert florists use their expertise and skill to design the most fabulous of bouquet. It is a promise by Stonehaven Flowers that any customer ordering a red flower bouquet will not be disappointed with the glorious array of colours available. Time is taken you produce each and every individual bouquet and you can take comfort in knowing that without fail Stonehaven flowers will deliver you the most astounding bouquet of blossoming flowers.